Over the years, Kevin Hart has proven to be a “bankable” star in this current age of Hollywood. This comedian-turned-actor started out in the comedy club circuit (winning amateur comedic competitions landing some small roles in several projects, including Judd Apatow’s short-lived TV series Undeclared as well as several films like 2002’s Paper Soldier, 2003’s Scary Movie 3, and 2005’s In the Mix. With his growing reputation, Hart caught his first “big break” in his performance in 2012’s Think Like a Man, which legitimized him in the mainstream media of feature length films. From there, as he continued to release stand-up comedy specials, Hart’s popularity grew in the movie industry, soon finding himself being paired with some other big-name actors on the silver screen, including rapper / actor Ice Cube in 2014’s Ride Along (and its 2016 sequel), comedian actor Will Ferrell in 2015’s Get Hard, and former wrestler / actor Dwayne “The Rock” Johnson in 2016’s Central Intelligence and 2017’s Jumanji: Welcome to the Jungle. Additionally, Hart’s very “animated” voice has also proven to be successful in animated cartoon feature films, providing vocal talents in Illumination’s 2016 The Secret Life of Pets and DreamWorks’s 2017 Captain Underpants: The First Epic Movie. Now, Universal Pictures and director Malcolm D. Lee see Kevin Hart star alongside up and coming comedian actress Tiffany Haddish in the movie Night School. Does this film “make the grade” with its comedic styles or does it fail its own cinematic test? Finding difficulty in receiving his education, Teddy Walker (Kevin Hart) is a high school dropout, with plans to make his “own way” in the real world. Become a prolithic grill salesman. Teddy is trying to play the part of a rich, hoping to entice is current girlfriend Lisa (Megalyn Echikunwoke), who is more successful than him, to stick around and marry him. However, his finances are mostly depleted, with Teddy hoping to catch his “big break” sometime soon. Unfortunately, disaster strikes and the grill business kicks him in the curve, Teddy scrambles to find work, only coming to the realization that he needs his GED to get ahead in life. Taking a spot in night school, the wayward man is fearful of learning, facing the hardened rule of Principal Stewart (Taran Killam), his old high school nemesis, and the focus of his teacher Carrie (Tiffany Haddish), who is not swayed by Teddy’s charming shenanigans. Joined by fellow night school classmates, including Big Mac (Rob Riggle), Mila (Anne Winters), Luis (Al Madrigal), Jay (Romany Malco), Theresa Mary Lynn Rajskub), and inmate Bobby (Fat Joe), Teddy tries to get a handle on his education, struggling with his new reality and unable to Lisa and reveal his shortcomings. Much like what I said above, Kevin Hart has surely become a somewhat “bankable” comedic star in the current age of Hollywood. While I haven’t seeing much of his earlier work, which was mostly small supporting roles, my first appearance of seeing Hart’s comedic talents was not his actual stand-up comedy routines, but rather from the 2012 movie Think Like a Man, with Hart playing the character of Cedric. After that, I saw a few of his standup comedy acts (my mom thought I would like them) and (for the most part) I did, finding Hart’s comedy to my liking and found myself laughing along through most of his jokes. Given his success, it was almost a forgone conclusion to see Hart in many other film projects, which he did with other Hollywood comedy tentpoles in the following years. Some have been “hits or miss” in my opinion, with the former being films like Jumanji: Welcome to the Jungle, Central Intelligence, the Wedding Ringer, and Captain Underpants: The First Epic Movie, while the latter are movies like Get Hard and Ride Along (and its bland sequel). Whatever your stance on him (love him or hate him), Kevin Hart has become a dominant force as a comedy actor and it doesn’t seem like he’s slowing down anytime soon. This brings me back to talking about the film Night School, a 2018 comedy film and the latest endeavor from comedian actor Kevin Hart. Given how popular and “bankable” he’s become, its almost a forgone conclusion that Hart would have a movie (or two) come out every year for the foreseeable future. Thus, it really came as no surprise that he was gonna be in a new movie, with another “big” actor / actresses co-starring alongside him (i.e. Tiffany Haddish). Of course, given how her performance in Girls Trip was the most memorable of the entire cast, I was quite excited to hear that Haddish would be in Night School. Plus, the film’s trailers, which I saw quite frequently during my weekly theater outings, made me laugh and showcased a promising view of the upcoming movie. Additionally, I’m always down for a comedy movie, especially since the movie stars both Hart and Haddish in it. Thus, I decided to check out the movie and see if it was “worth the watch”. What did I think of it? Well, to be honest, it was merely okay. While the movie makes for an amusing set-up and some flourishes of comedy antics (mostly due to the acting talents in the movie), Night School suffers from being a formulaic “paint-by-numbers” routine that becomes messy in its story / script handling, which diminishes the chance for the film to be memorable. The movie definitely has potential and there’s some stuff to like about, but it never reaches its full potential. Night School is directed by Malcom D. Lee, whose previous directorial works includes films like Girls Trip, The Best Man, and The Best Man Holiday. Given the success of how Girls Trip was received by both critics and moviegoers, Lee’s directing talents seem like a natural fit in doing a feature film like Night School. To his credit, Lee stages the film in a way that seems quite amusing, setting up a humorous premise that’s a perfect vehicle for Hart to drive around. Lee, also knows how to utilizes the comedic presence of his assemblage of actors / actresses, producing some hilarious moments that actually do work, despite the film lacking in some of the “sharpness/ wittiness” dialogue. Suffice to say, Lee approaches Night School in an semi-entertaining way and, while it may not be as collectively wholesome or downright funny as Girls Trip (or some of his other past endeavors), at least its an enjoyable film to watch. Lastly, the film also touches upon an interesting subject matter, finding the film’s main character (Teddy) having a learning disability. When I was younger (sharing something personal with you guys), I was “diagnosed” with having a learning disability, being coded of having dyslexia and ADD (i.e. Attention Deficit Disorder). As one can imagine (like Teddy in the movie), I too struggle in school growing up in various classes, having a difficult time in trying to “cope” with my learning disability. Thus, I can really sympathize with Teddy (knowing what he’s going through), with Night School presenting this social commentary message in a mainstream movie. However, I wish it could’ve gone deeper (more on the below). In the end, however, it was a pretty interesting notion to present and a compelling concept for me to see a mainstream comedy movie. As a presentation, Night School hits all the right measure in the way of technical filmmaking for the status quo of today’s comedy features. With comedy movies, I don’t really judge hard on the movie’s technical presentation as the film mostly realizes on cast and the film’s writing to heighten the film and not so much on the more presentation wizardry on something like a period piece drama or a big-studio blockbuster endeavor. That being said, majority of the efforts in the technical “behind the camera”, including production designs by Keith Brian Burns, set decorations by Patrick Cassidy, and costume designs by Sekinah Brown are solid in their respective fields. As for the cinematographer work by Greg Gardiner, is good (again for straight-forward mainstream comedy feature), with a few creative camera angles and cinematic endeavors that are scattered across the film’s runtime. Additionally, while the film’s score, which was composed by David Newman is solid (creating several flourishes and melodies that seems appropriate for a comedy movie), the film also has several musical songs within its compilations, including Jason Derulo’s “Kiss the Sky”, T.I.’s “Whatever You Like”, Sarah Bollinger’s “Found My Vibe”, Outkast’s “Hey Ya!” and several others that add a variety of musical selections in Night School. Unfortunately, Night School does live up its own hype as being a “slam dunk” comedy endeavor and ultimately ends up being a mediocre one due to several problems that the feature can’t overcome. Perhaps the key “culprit” lies within the handling of the film’s screenplay and how works as a context for the narrative in the film. Why do you ask? Well, Night School doesn’t have one or two or three screenplay writers, but rather six (yes…. six! ), with them being Harry Ratchford, Joey Wells, Matthew Kellard, Nicholas Stoller, John Hamburg, and Kevin Hart himself. As one can tell, the film’s script has that classic “too many cooks in the kitchen” and the film itself (i.e. the main narrative) comes across as being a messy hodgepodge of ideas. Further examination into the script shows that the movie’s plot, which compelling to a certain degree, is very much like an episodic endeavor (a series of subplots) that kind-of-sort-of fills up majority of the film’s runtime. In truth, one of these subplots (involving several of the students banding together to steal a test), which does eat up a huge chunk of the film’s runtime, could’ve been easily expanded upon for its own movie (to be honest…a movie already did that plotline with 2004’s The Perfect Score) or even a comedy sketch outline for a TV episode. But I digress. However, Night School seems to cram a lot of minor subplot / side-stories into the movie that it almost sacrifices a large portion of the film’s main narrative, which is supposed to focus on Teddy. Because of this, the movie lacks a proper / natural flow and cohesive story progression, which makes the plot’s various concepts half-baked and never fully realized beyond a few moments here and there. This also effects the film’s pacing, with Night School’s runtime clocking in around 111 minutes long, and feels much longer than it needs to be. Some parts drag, some parts seem unnecessary, and some parts could’ve added more substance. Thus, a better film editing would’ve been better for the movie’s final cut. Again, this goes back to the film’s script and how poorly structured it is, with so many “hands” in the creative concept. Another problem I found while watching Night School was the fact that the movie only skims the idea of its own social commentary message, which is indeed a powerful / meaningful one. As I mentioned above, the character of Teddy has a learning disorder and he decides not to address; fearing what others might think of him, while sacrificing a proper education. As stated, its very poignant thing to tackle, especially within a mainstream comedy feature, but, given the messy handling of the film’s script, the message its watered down and almost lost along the way. What’s suppose to be a thematic meaning of a person’s self-esteem with coping with disabilities or disorders are brushed aside and mostly played for laughs. The movie offers an explanation as to “why” Teddy doesn’t seek help for his learning disability, but its too vague as if the film’s multiple script writers nor Lee feel its important to talk about on-screen. To be honest, the reason “why” could’ve been its own movie or (at the very least) could’ve been easily expanded upon. The film’s tries to tie into the movie’s final moments, but it’s a bit “too little, too late”. Personally, I was hoping the Lee, given the fact of how he handled and tackled a meaningful message in Girls Trip (i.e. the importance of friendship and a person’s position of being in a toxic relationship instead of being alone), would provide a great context in Night School. Unfortunately, Lee does not, discarding much of the commentary message for some cheap laughs and a missed opportunity. Naturally, the cast in Night School is what makes the movie enjoyable, despite the various problem / shortcomings that the film can’t overcome. Of course, the big highlight of the feature (i.e. the “big ticketed” stars) are comedian actor Kevin Hart and upcoming comedian actress Tiffany Haddish, who play main character Teddy Walker and night school teacher Carrie respectfully. Together, both Hart and Haddish have proven themselves (in other projects) to comedian “forces of nature” by bringing plenty of laughs and their magnetic energy to the proceedings. In Night School, however, both comedic talents are as they say “in their element”, but neither one delivers a great comedic performance. With Hart (well, you know what movie roles he’s been in from the opening paragraph), he basically plays himself and a lot of the other iteration he’s done before in his filmography (i.e. a fast-talking / high-strung scam artist who gets by his own charisma). It’s worked before and certainly does work here, but his roles as Teddy is a less-than memorable one, especially when comparing it to some of his more recent roles in better movies. Basically, Hart plays his tried and true comedy shtick, but the character of Teddy Walker is far less interesting and bland than what Hart could’ve done with him. Likewise, Haddish, known for his roles Girls Trip, Uncle Drew, and The Last O.C., makes for a convincing enough straight-laced woman to Teddy comedic antics, though she’s definitely been better in other endeavors. Together, the duo creates some “moments” that are truly great and laughable (i.e. the first time that both Teddy and Carrie meet), but majority of the time the pairing chemistry isn’t exactly what Lee (nor the viewers) envisioned. There’s some there and it semi-works, but it could’ve been a whole lot better, especially given the fact that both Hart and Haddish have great comedic backgrounds and have proven themselves effective in their fields. Beyond Hart and Haddish, actor Taran Killiam, who plays the somewhat antagonist figure of the movie as Teddy’s old high school rival Stewart, who is now the high school principal. Killiam, known for his roles in Saturday Night Live, The Heat, and 12 Years a Slave, does seem to have a bit of fun playing the character of Stewart, playing some “wacky” scenes with a straight-face was pretty amusing (i.e. the thing about him trying to “sound” black / African American at various parts) and does fit the “bill” as the overzealous high school principal. Problems is that the character of Stewart seems to “peter out” as the movie enters into the third act. It’s shame as it would’ve been something interesting to see him get “crazier” as the deranged high school principal, who believes he wields power over everyone, including Teddy. The last major player is the character of Lisa (Teddy’s fiancé), who is played by actress Megalyn Echikunwoke. Known for her roles in Damien, Vixen, and Made in Jersey, Echikunwoke somewhat gets the role of the independent / caring wife for the main protagonist character, but ends up being the least memorable of the major cast members. Why? Well, the character is written rather poorly; merely just being an obstacle and “cog” in the narrative machine. Plus, Echikunwoke doesn’t really make the character her own as the role could’ve been played by anyone. Suffice to say, the character of Lisa just ends up being generic and forgetful. Behind them are the other major players in the movie, which consist of the rest of Teddy’s night school classmates, including actor Rob Riggle (Jump 21 Street and Midnight Sun) as the slightly dimwitted Mackenzie aka “Big Mac”, actress Mary Lynn Rajskub (24 and The Girlfriend Experience) as hard-working mom Theresa, actor Romany Malco (Almost Christmas and Think Like a Man) as the neurotic individual Jaylen, actor Al Madrigal (I’m Dying Up Here and About a Boy) as the recent unemployed Luis, actress Anne Winters (13 Reasons Why and Tyrant) as a deadpan hipster youth Mila, and is rapper / actor Fat Joe (Happy Feet and Lady Rider) as incarcerated prisoner Bobby, who skypes into the night school class to get his GED. Collectively, this group makes up the bulk of film’s comedy, with each actor / actress bringing their theatrical comedy acting talents to these characters and producing a few memorable “laugh out loud” moments that made me both chuckle and one or two full belly laughs. However, while each character has an initially set-up build for the actors / actress to play off of, the dialogue given to them isn’t as sharp as it could’ve been. Again, this goes back to the film’s script and how it was handled, which is a shame as some of them material could’ve been funny, but ends up being flat for the most part. Thus, the acting talents of the individuals helps aid in bringing the thinly-sketched characters to life. Basically, these actors / actresses were funny in the movie, the characters (and the dialogue given to them) wasn’t. The rest of the cast are considered minor supporting characters, including actor Ben Schwartz (Parks and Recreation and House of Lies) as Teddy’s best friend Marvin, actress Yvonne Orji (Insecure and Jane the Virgin) as Lisa’s friend Maya, actress Bresha Webb (Meet the Blacks and Ride Along 2) as Teddy’s sister Denise Walker, and actress Donna Biscoe (One Missed Call and Hidden Figures) and Keith David (Gargoyles and The Princess and the Frog) as Teddy’s parents Carole and Gerald Walker. While all of these supporting players give good acting performances in the movie, majority of them are pretty forgetful (due to their limited screen-time / importance to the film’s narrative), with only Schwartz’s Marvin being the only memorable one. Comedy ensues as high-school dropout Teddy Walker heads back to night school to get his GED in the movie Night School. 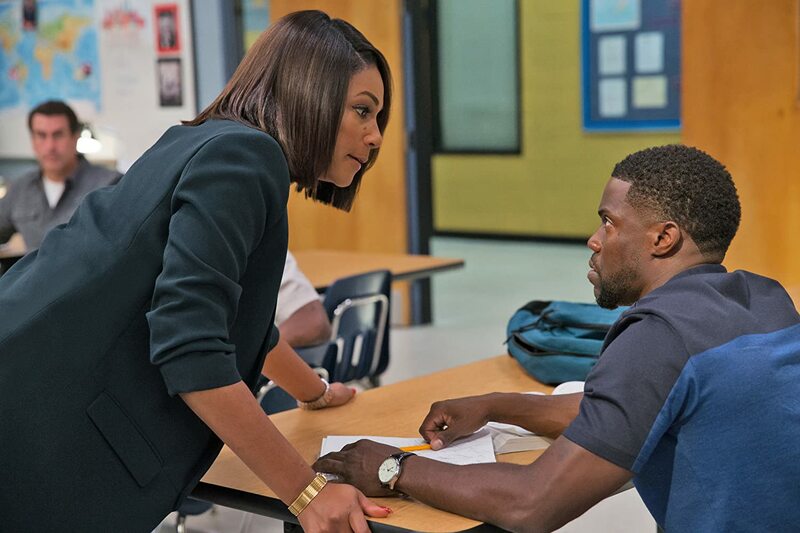 Director Malcom D. Lee latest film sees Kevin Hart and Tiffany Haddish (and other familiar faces) project an interesting / humorous tale of teaching, education, and various comedic skits throughout. While the movie delivers on some humorous bits (creating a lighthearted Hollywood comedy endeavor) as well as benefiting from the acting talents of the cast and does have enough entertainment value to make the it all enjoyable, the film can’t overcome its problematic struggles, which consists of a hodgepodge of subplots, a messy script, some unfunny dialogue moments, and a failure to fully commit to the story’s own social commentary message. To me, this movie was okay (I think I liked it a bit more than the general consensus of movie critics out there). As I said, it’s a passable entertainment movie, but it was also a bit disappointing because the movie doesn’t live up its own full potential. Thus, my recommendation for this movie is both an “iffy-choice” as some might like it (depending on what “tickles you funny bone” or if you’re huge fan of Kevin Hart’s comedic routine), while others might not; believing it’s an adequate movie feature. Then again, I would also say that this movie would be a favorable “rent it” as well, it has enough material to watch one night. In the end, while Kevin Hart will most likely continue to produce and star in Hollywood comedy tentpole movies in the coming years, Night School stands on the lower end of the spectrum of his career. It has all the right elements and ingredients to make a very funny comedy film, but it just ends up being a passible one. Again, it just depends on what makes you laugh. It actually sounds better than I was expecting, based on the trailer! Definitely sounds like something to watch at some point. It’s a bit better than most critics are given it. Definitely worth checking out as a rental…sometime in the future, especially if you’re fan of Haddish or Hart.